People living in modern world are surrounded by various electronic machines and devices, and society enters digital era. Thus, it is not at all surprising that almost everyone needs files recovery tools. Such tools are capable of retrieving files that are no longer at hard drive and USB drives. Have you experienced or wondered that all of your files could be erased or deleted due to careless operations? How do you think of those lost files? Are they just gone for good or hiding someplace obscure at someplace on storage device? What are the chances that lost files can be restored? After doing a Google searching, you’ll get to know the major solution for the moment is file recovery software which is developed for the sake of saving missing data from mass of file loss situations. This includes file deletion, hard drive or partition formatting, file system corruption, virus attacks that cause files damaged or deleted. Qualified data recovery software is not just used on hard drive. Downloading software online for free is available to all computer users. And many programs can be tried for free prior to payment, which is added advantage for some programs. It can recover files from a multitude of drive types like hard disk, zip drives, USB flash drive, portable drive, external hard drive. It allows you to recover deleted files or formatted files due to any causes. It can work with a handful of devices, for instance, digital camera, memory card, pen drive, cell phone, flash drive, laptop, workstation, RAID, virtual disk, SSD and more. You can scanning drives deeply and rapidly for lost files. Hard drive with bad sectors is also supported. The entire recovery process is read-only, and no lost content will be affected. Multiple recovery modes are provided for different file loss problems. 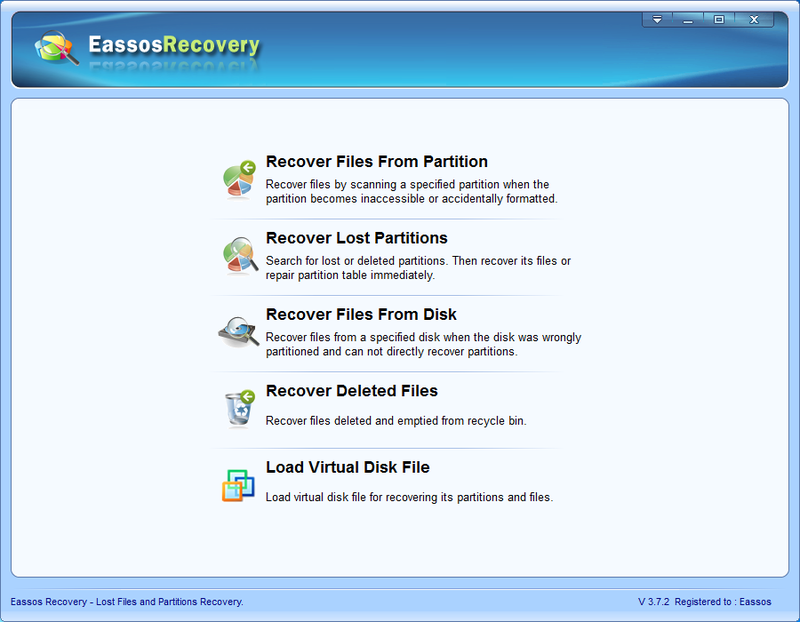 In the first place, download and install Eassos Recovery. You can download and learn more detailed information about the program by visiting its website. Step one, select suitable recovery mode for lost data. 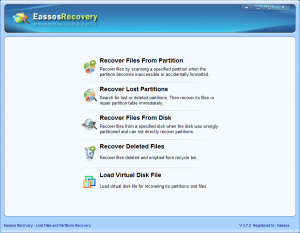 Get the program started by double clicking the icon of Eassos Recovery on desktop and you’ll see five recovery modes on the user-friendly interface. Step two, choose hard drive or partition and scan files. Click the partition that needs recovering files and click “Next” button, and the file scanning process starts up. 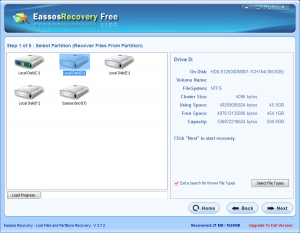 For example, if lost files were stored on E partition before they were emptied from Recycle Bin, and you should select E partition instead of C partition, even though the Recycle Bin belongs to C partition. Step three, preview and recovery. Pick out files you want recover by means of file preview and file filter features, and get files recovered. 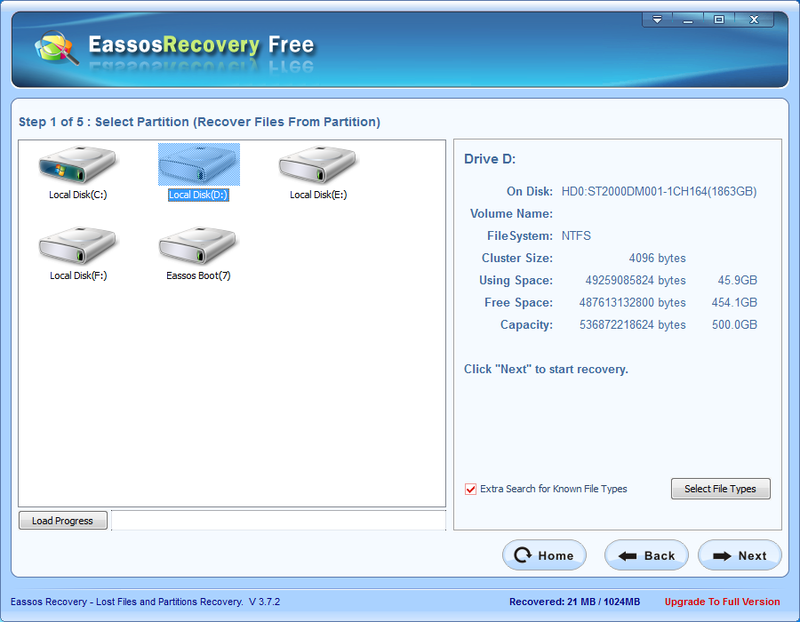 This entry was posted in Data Recovery and tagged file recovery software, recover deleted files by EASSOS. Bookmark the permalink.